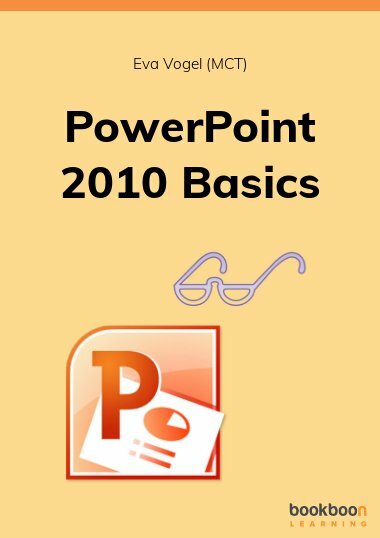 Explore creating, designing and animating your slides in PowerPoint 2010. Look at the differences between the Office 2003 and 2010 Objects and their time-saving layouts and quick styles. Explore creating, designing and animating your slides in PowerPoint 2010. Look at the differences from Office 2003 to 2010 Objects and their time-saving layouts and quick styles. Create an example to learn all the basics for a better presentation with Power Point. My name is Eva Vogel. I have published many German eBooks on Bookboon which you can find here. I have been a Microsoft Certified Professional (MCP), Office Trainer and SharePoint/Office 365 Consultant in Nuremberg (Bavaria) since 2004. I started writing for Bookboon in 2011 to give readers exclusive insights and ideas when using Microsoft Office and beyond. I took my first PowerPoint steps long ago. I am enthusiastic and curious about all things Word, Excel, PowerPoint, Outlook, SharePoint and OneNote. My certifications and other publications as Microsoft Specialist in all those Microsoft Office and SharePoint Environments are also available on LinkedIn and Xing. Why use shortcuts in Office? What if the Excel Data Title is not changeable to “None”? This Chart as a new Template? Choose and Use! Where is the image? It’s in the background!